How do I find my survey IDs? There are two quick ways to find your survey IDs. 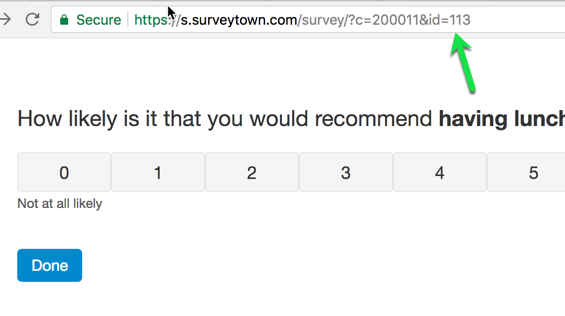 For the survey edited with this URL, https://login.surveytown.com/surveys/Survey_Form.php?&iSurveyID=120, the survey ID is "120"
You can look at the survey ID at the end of the URL when you publish your URL. For the survey that is published at the URL https://s.surveytown.com/survey/?c=200011&id=113, the Survey ID is 113.